Preliminary design plan for a large scout cruiser, prepared to support General Board discussions concerning the characteristics sought in future cruisers. 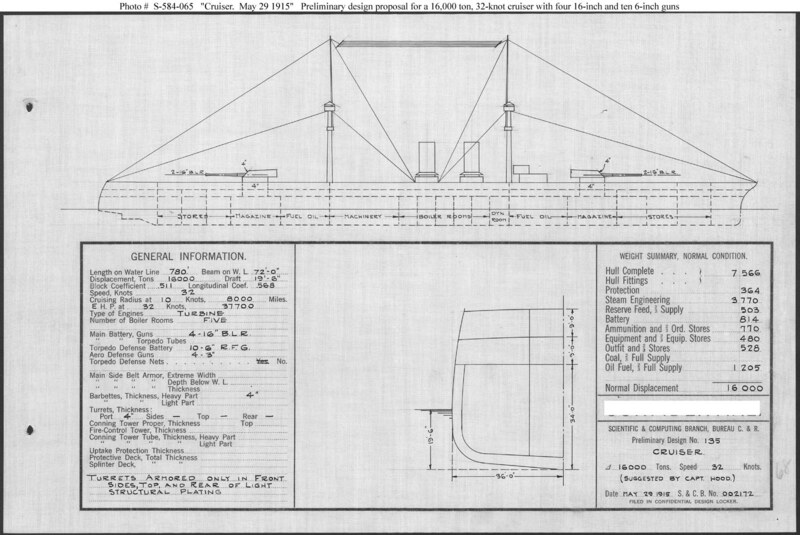 This plan provided four 16-inch guns and ten 6-inch guns and a speed of 32 knots in a ship 780 feet long on the load water line, 72 feet in beam, with a normal displacement of 16,000 tons. This design included only 364 tons for 4-inch armor for the heavy gun barbettes and front shields. This design was requested by Captain John Hood, head of the General Board committee responsible for ship design, apparently to explore to what degree a speed increase of two knots over Design No.134 (see Photo # S-584-073) might increase the size of such a ship. This design series took Preliminary Design No.112 (see Photo # S-584-050) as a baseline. Ultimately, however, no ships of this type were built.